This single frame NAVCAM image was taken on 14 March at a distance of 81.4 km from the centre of Comet 67P/Churyumov-Gerasimenko. At this distance, the resolution of NAVCAM is 6.9 m/pixel. The image is cropped and measures 6.4 × 5.9 km (the original picture, uncropped, is provided at the end of the post and measures 7.1 km across). The image was taken on the same day as Wednesday’s CometWatch entry, but six hours later – roughly half a comet day. In this unusual orientation, the comet’s large lobe is up and the small lobe down, while the neck region is cast in shadows. The Lightroom processed version shows beautiful structures of outflowing material from the neck, as well as from the large lobe. There is also a more general ‘glow’ around the comet, suggestive of generally increasing activity all over the surface. Finally, the large lobe can be seen casting a shadow over the nebulosity beneath it. On the large lobe, another striking feature catches the eye: the Aten region, an elongated depression between Ash, to the left, and Khepry, to the right. No doubt the most extraordinary image of jetting activity so far. Who would have thought until now that such huge, wide-diameter jets from the surface of 67P could so faithfully replicate a 90° plumber’s elbow bend after just a couple of hundred metres or so! I wonder what the cause is. The force in question must be incredibly powerful…. Any suggestions, anyone? They look very odd in any theory, & there is a most peculiar ‘right angle’ structure too in the difuse area if you drop a vertical line from the left hand edge of the upper lobe. I wouldn’t rush to interpret this until we are sure its not some sort of artifact. It would be very interesting to hear a view from the ESA team, the appearance is very odd. NOT in the EU model. Quite the contrary (see my follow-up comment below (23/03/2015 at 12:25)). “It would be very interesting to hear a view from the ESA team, the appearance is very odd”. I greatly appreciate your understatement, Harvey and the frankness of the incomprehension you express. Could this be the required trigger for a veritable “Damascus experience”? I went through mine around 15 years ago when I had the revelation that all the “dark” entities dreamed up to uphold the standard creationist Big Bang theory were all, without exception, quite simply contrary to the basic laws of physics as they are currently understood. I much prefer scientific theories which are firmly grounded on actual observation. without thinking one second doesn't solve anything. My first idea was: "Wow the sublimating gas is now dense enough to show a laminar flow, dragging dust in a curve!" Not the remotest association with electric universe non-science. And answering every new question about this comet (and there have been many) with some new hypothesized, contrived and often contorted version of “nothing to see here, still just ice and dust” is equally as boorish. Maybe, but it’s closest to the facts. Much more interesting is the chemical composition, e.g. to which complexity the building blocks of life could develop on the comet. Of course details of the formation of the coma and ionosphere/magnetosphere etc, are interesting, too. But discussing all the time the inexitstent electric universe stuff is completely useless. How and why would a laminar flow of sublimating gas “drag dust in a (90°) curve” from this precise part of 67P’s anatomy? Could you explain, please. I guess your “first idea” wasn’t your best ever. There is no warranty, that the first idea is the best one. Gerald, while I and others question whether gravity is really an adequate force to explain many of the phenomena in space that are attributed to it, it’s clear that you question electricity’s capacity to explain much of anything in space either. But as sort of a baseline, I was just wondering what your definition of electricity is, and based on that definition, if you find any evidence of electrical activity in space at all, and if so, what is that evidence and what effects does it produce? There are of course a long list of electromagnetic phenomena in space, including electric discharge, aurora etc. But those phenomena rarely compete with gravity on a larger scale. And they are very distinct from sublimation. All electromagnetic waves from radio waves over infrared, visible light, ultraviolet, x-rays, gamma rays are electromagnetic phenomena. Solar eruptions are mostly driven by magnetic energy. There are likely lightnings on Jupiter, aurora on Ganymede. Electrons are bound by electrostatic attraction to atomic nuclei. You get photoelectricity by uv radiation, which may remove one ore more electrons from an atom. The dynamo effect most likely generates the strong magnetic field of Jupiter, by currents in the metallic liquid hydrogen in Jupiter’s interior. But the jets at the comet are not plasma discharges; that’s just dust dragged by gas due to sublimation of ices (and maybe decomposition of clathrates)., driven by solar illumination (consisting of electromagnetic waves). Observing a large electric discharge at the comet would be great, but thus far there is no such observation. And I know, that these approaches aren’t yet the final answer, but they work very good in most cases. We get at the frontiers near Black Holes and close to the Big Bang. Good information, Gerald. So, based on what you posted, it seems far to say that electricity is quite evident in space, and reveals itself through a wide variety of characteristics, forms, and displays, though of course it has little or nothing to do with explaining P67 coma, which can only only only be explained by ice. And that there are varying strengths of electricity, from very small scale events at the molecular level to relatively large events like the lightening strikes on Jupiter. I’m wondering if the upward scale of electrical strength has been discovered yet, or even considered by most…no doubt an irrelevant musing regardless. And when you say further up in these posts that gravity can be very, very, very strong, there are gravitometers that accurately measure gravity, the GRACE satellites that do the same, and no doubt other instruments that measure gravity. So you’re saying that one of these instruments that are designed and tested and confirmed to specifically measure gravity have measured it to be very, very, very strong, as in approaching black hole strength? If so, what was the instrument and what was the measurement? So the answer to my question about an instrument that’s designed to measure the strength of gravity having ever actually measured “very, very, very strong” gravity is no, gravity has never been measured by a gravitational instrument to be strong at all. Strong gravity is hypothesized, and yes, there are things like “gravitational lensing” used to try support this hypothesis, but it definitely relies on pre determined interpretations of observed phenomena. Outside of the hypothetical, really strong gravity hasn’t been measured to exist. But really strong electricity isn’t just hypothetical, it exists within the “real” world, and for this and other reasons I think it is therefore better positioned to build a more accurate model of cosmology upon. So the answer to my question about an instrument that’s designed to measure the strength of gravity having ever actually measured “very, very, very strong” gravity is no, gravity has never been measured by a gravitational instrument to be strong at all. Strong gravity is hypothesized, and yes, there are things like “gravitational lensing” used to try support this hypothesis, but it definitely relies on pre determined interpretations of observed phenomena. Outside of the hypothetical, really strong gravity hasn’t been measured to exist. But really strong electricity isn’t just hypothetical, it exists within the “real” world, and for this and other many other reasons I think it is therefore better positioned to build a more accurate model of cosmology upon. No, electricity isn’t appropriate to substitute gravity, since same charges repulse each other. The universe would behave entirely different, if it could exist at all. Look at binary or ternary stars, or at closed (globular) star clusters. How should stars be charged to attract each other? That’s simply impossible to model with electricity. Btw. Where is the laboratory experiment showing that electricity warps spacetime? GPS wouldn’t work, if general relativity would be wrong. Where is the general relativity equivalent of electricity? Where is the electric instrument directly measuring the cause for Einstein rings? Which electric laboratory experiment can juggle stars like the SMBH in the center of our galaxy does? How can electric charges be attractive enough to juggle stars without disrupting them by repulsion? How are stars and planets recharged after discharging? Shouldn’t planets spiral away from the Sun due to loss of charge? Shouldn’t our atmosphere be lost due to eletrostatic repulsion? How do tides work on an electric basis? No sorry, you run into trouble from begin to end when trying to discuss away gravity. Sovereign Slave, try to lift an apple by electrostatic attraction. Should be easy, since electrostatic forces are so much stronger than gravity, shouldn’t it? Gerald, your’re misrepresenting the theory/argument, then poking holes at the misrepresentation. No one is suggesting that gravity doesn’t exist and that everything that is being credited to gravity is actually electricity. The argument is that gravity, as the very weak force it is (and which I can’t help but notice you did not now contest as there are no measurements showing it otherwise), is extremely unlikely to account for many of the things being credited to it in cosmology, and that the force of electricity should be considered, explored, measured and experimented with much more than it is when seeking explanations for the many many mysterious observations encountered in space, and that like gravity is considered to be now, it might actually be a more cosmically unifying theory than gravity. this would be a basis we could talk reasonably about electromagnetic phenomena – and there are a lot. Some “electric universe” proponents seem to have (or have had) a very distorted imagination of physical reality, not necessarily everyone. I don’t see a large imbalance in established astronomy between electromagnetic phenomena and gavity. This doesn’t rule out, that in cases of doubt there may be some different assessment between scientists. Particularly difficult is finding evidence for gravitational waves, since they are very subtle, and some observations are ambiguous, like polarization patterns of the CMB. They can be caused by gravitational waves, as well as by spinning dust grains. Please explain how the Big Bang is a creation event and what laws of physics are violated given the Planck time of 10^-43 second. Do you understand the Big Bang theory pre-dates, the inclusion of dark matter and dark energy and is based on observations such as the CMB, the anisotropies within the CMB and cosmological redshift to name a few. Do you understand the differences between phenomenological and non phenomenological theories in physics? Dark matter and dark energy, like Newton’s theory of gravity are phenomenological in nature. Do you deny the existence of gravity even though the effects of gravity are observed (like dark matter and dark energy), despite the fact we do not even have a workable theory on the cause of gravity based on the existence of gravitons that as yet have never been observed. sjastro, you can’t assume something to be true and then use your assumption to prove your assumption. And there are countless other assumptions and beliefs underlying these specific beliefs about Big Bang, etc, and while I do believe the Big Bang, dark matter, dark energy, on and on are simply highly intellectualized and imaginative nonsense, I would not have nearly so much problem with theses theories if 1. they were accompanied by many other optional, fundamentally alternative theories that were considered and actively investigated by mainstream 2. they weren’t endlessly used to interpret “live, right now” scientific findings and observations, and 3. they weren’t presented as fact as much as they are, 4. there were standards of scientific proof established to determine invalidation of theory instead of the endless ad hoc chameleon adjustments are made are constantly made so these theories can remain alive. And I’m not saying it should all be EU theory, but the speed and off-hand manner in which EU and other thinking-outside-the-mainstream-box theories are reflexively dismissed reflects badly. Regardless, as I see it strictly regarding mainstream vs EU theory, it comes down to which force best explains the wide variety of phenomena we see and measure in the universe – gravity and mega gravity or electricity and mega electricity? Neither force is “proven” to be responsible for star and planet formation and structure, high energy events, etc etc. But two bedrock facts seem very well established: “naturally occurring” gravity, the thing you talk about observing the effects of above, has always proven (based on real scientific validation) itself up till now to be an incredibly weak force that has never been proven (based on real scientific validation) to be highly scalable in nature, and electricity CAN be a very strong force (based on real scientific validation) that HAS been proven (based on real scientific validation) to be highly scalable in nature. Many other people’s sensibilities are obviously different, but mine “gravitate” me toward believing that since electricity has been shown to be virtually everywhere and is scalable and is much much stronger than gravity, this theory is better positioned to explain many things we observe in the cosmos than gravity is, which, while everywhere, has not been shown to be scalable or very strong at all. But given that, yes, both theory bodies are very poorly supported scientifically at this point, to the point where countless holes and inadequacies can be justifiably pointed out in each, without adequate response. Again, open minded scientific inquiry would maintain these and any other models and theories as both useful and highly questionable as ongoing investigation reveals further facts, findings, and observations. And gravity is purely additive, cannot be shielded like electric fields. Electricity is not an alternative for explaining the large-scale structures in our universe. Unification of electricity and gravity has been attempted since about 100 years; without (final) success. There have been, and still are working really smart people on solving these questions. Albert Einstein spent 40 years, from 1915 until 1955 with attempts to get gravity and the other forces unified, just to mention one of the most famous scientists of this field. Electric universe stuff isn’t remotestly any reasonable option. You have some gross misconceptions about Science. Science is not about truths, proofs or beliefs. A scientific theory is only as good as the observations or experiments that support it. As technologies for observation and experiment improve, theories may no longer be considered accurate. An example is the Newtonian theory for the Moon’s orbit. For 250 years this was considered an adequate model until Apollo astronauts put mirrors on the lunar surface that allowed the Earth Moon distance to be measured with greater precision. Since Science doesn’t involve “proof” it is not as rigorous as pure mathematics and therefore does allow the scope for making assumptions in the development of a theory, provided the theory is falsifiable or in other words can be supported or refuted by observation or experiment..
As far as electricity being scalable, I “assume” you are referring to the scalability of certain parameters such as electric and magnetic fields in plasma physics. One of the great misunderstandings made by EU supporters is the literal interpretation that other parameters are scaled down accordingly and you end up with a scaled down version of space in the laboratory. In order to downscale the electric and magnetic fields from a cosmological to a laboratory scale you need to UPSCALE the density accordingly. As a result the density of a laboratory plasma is billions of times greater than plasma in extragalactic space. The argument that we should dispense with gravity because electromagnetic forces are much stronger fails for two main reasons. Firstly in a plasma environment the range of the Coulomb force between two charged particles is governed by the Debye length and is caused by plasma shielding. The Debye length for the intergalactic medium is typically only 10^5 metres. Clearly the range of the gravitational force is far greater! Secondly consider a 3 body problem. With gravity there is a force of attraction between all bodies. If on the other hand the bodies carry a charge, then it is clearly obvious that attractive and repulsive Coulomb forces exist. How can you explain this system as being stable? Needless to say if a 3 body system is unstable it doesn’t go well for more complicated structures. Btw. the strong nuclear force is about 100-times stronger than electromagnetism in the femtometer scale. The strength allone is meaningless. Look also at distance, sign of the charge, and shielding. Next, AFAIK, the ensuing “inflation event” which is required to account for the “horizon” problem has never been *observed* in the real world and can thus hardly be a part of correct scientific method. I therefore conclude that it is a simple product of mathematical imagination and scientific expediency. (Unless you can cite the actual “law of physics” it obeys…). – The theory of “cosmological redshift” has already been utterly falsified by the meticulous observations and uncompromisingly rigourous scientific methodology of Halton Arp, who was indisputably the most brilliant observational astronomer of modern times. In case you’ve never heard of him, we owe him the “Arp Atlas of Peculiar Galaxies” http://ned.ipac.caltech.edu/level5/Arp/Arp_contents.html and the hundreds of galaxies imaged therein still bear his name in the suffix of their scientific designation. By his numerous observations of actual physical associations between high-redshift quasars and low-redshift active galaxies and simply in application of the scientific method, he conclusively falsified the theorized cosmological nature of redshift, and proved that redshift is actually an *intrinsic*, quantized property of matter in certain states, yet to be understood. To thank him for his paradigm-shifting work, the astrophysical establishment denied him any further telescope time and sacked him from his CALTECH job despite him nominally having tenure there. (Hence his nickname “the 20th Century Galileo”…). Halton Arp killed the gravity-based BB theory stone dead at a stroke with his observations, as Galileo did to the geocentric theory of the Universe with his telescope several centuries before him. I can only second sjastro. For the pre-Planck epoch can only exist mathematical models, since energy levels have simply been too high to be feasible for experiments. But there is a big differnece in that approach between a mathematical point and the presumed non-causal structure below the Planck scale. Tiny doesn’t mean zero length in the mathematical sense. So THOMAS, since you lack any basics in that field, don’t even try to find flaws. The weak point which I readily accept is the lack of direct observational evidence for the electroweak epoch and before. So we can’t precisely pin down the actual parameters. The current state of “knowledge” is incomplete, and awaits further investigation. Again “electric universe” is no valid answer for the remaining uncertainties. I think you’ve missed the point, Gerald. I’m not interested in “finding flaws” with your mathematical models (even if I had the training to do so…). The point I’m making is simply that your mathematical models have no actual connection with reality. They are simply *mind* models, reliant on belief in such unobservable, hypothetical and hence unfalsifiable entities as “inflation”, “neutron stars” and all the “dark” stuff. That is where I (and many others) see a “flaw” (as you call it) in the mainstream model. It’s as simple as that. (Sorry for the apparent delay in responding BTW, but the substance of this comment was actually submitted on 02/04/15 at 9:30, as what I considered to be a justified and moderate right of response to your ‘ex autoritate’ injunction to stop finding flaws with your arguments: I’ve just noticed that it failed moderation for reasons I ignore. I guess the moderators had too much on their plates around that time. But better late than never…). The simple answer is “perspective”. The right angle at the left is due to a shadow from the body (sunshine from top, and a little behind the observer). That’s clear. But the curved jets or collimated jets look real. Let’s break this down. We are looking at a single frame NAVCAM image recorded on 14 March at a distance of 81.4 km from the center of 67P. There is no data overlay to indicate what forces or other physical processes may be at play here. So, what can we observe? The sun is at top of frame, and is calculated to be roughly 2.15 AU away. The reflective dust halo appears thicker over the body compared to the head. A plume (or sheet) of dust is being ejected from the body and forced to the left of frame. A pronounced shadow is cast by the body onto this feature, as well as other dust from the comet’s halo. Remember, we are looking at light reflected off dust emitted by the comet. Because physics is universal, there are times when Earth analogs can be quite helpful in understanding a phenomena. In this case, what happens when smoke leaves a chimney and is caught by the wind? As an extension to this, and evidence that we are dealing with dust, it was previously reported by the GIADA team (Rotundi et al, 2015) that at a distance of 3.4 AU, 67P was experiencing a dust loss rate of 7 +/- 1 kg/s. Assuming no increase in the rate (which is highly unlikely given the extraordinary images released by ESA over the last several months), this conservatively equates to loss of over 90.7E06 kg of dust and other non-gaseous material since September. While, tis true that this is just one possible explanation, it does take into account, cometary physics and some simple qualitative mathematics. By attributing it to an interaction of the two flows, you are implicitly assuming viscous flow. We don’t know the pressure profile close in to the comet, but it will drop very rapidly. At some point the mean free path will become comparable to or larger than the scale size of the features concerned, and the flow is molecular, not viscous. No ‘interaction’ of two plumes would then occur. Or one could turn that round; if the evidence of interacting plumes becomes convincing, it gives a rough guide to the minute mum pressure there. In the ejection region, it’s quite possible we have a (viscous) choked flow situation. In this case the velocity becomes rather independent of reservoir pressure over a large range, roughly sonic. So unless the reservoir pressure drops below a critical value due to reduced heat input the velocity could be quite constant. I would caution against ‘Earth analogs’, they just as frequently misslead as they inform. We are not used to hard vacuum, low Gravity, low temperature, hard UV illuminated conditions on earth, and common sense and ‘every day experience’ can misslead severely. But it’s a please to see rational analysis with some numbers! This (and the ensuing development) is indeed pure speculation, entirely based on the initial assumptions of the standard theory which 67P’s behaviour (in addition to its appearance and the temperature data sets) is increasingly challenging. What you actually mean, is “Because we assume the laws of physics underpinning the standard theory to be universal”. This is precisely one of the sacrosanct assumptions which 67P is severely constraining. “there are times when Earth analogs can be quite helpful in understanding a phenomena [sic]”. Apparently, “Earth analogs” are to be used only when they suit the defenders of the standard theories. At other times, for example when the cliffs and outcrops on 67P look for all the world like solid, stratified rock, we are bluntly told that such comparisons are “utter nonsense” given the very different conditions prevailing on 67P. In the interest of scientific rigour, it would be nice if the standard theory proponents could define for everyone the precise rules determining the conditions in which Earth analogs are to be considered valid or not. As the saying goes: “You can’t eat your cake and have it” (and not “You can’t have your cake and eat it” as it is often absurdly misquoted…). How do you find this particular “Earth analog” helpful? Which particular “universal” law of physics are you invoking? Booth’s approach is at least in many points reasonable. Some implicite assumptions may turn out to be incorrect. But considering some lack of reliable knowledge, i.e. geometry, velocity and density of the jets, it’s a reasonably self-consistent scenario, and a honest try to explain the observations. You asked for “suggestions anyone?” Booth provided a suggestion Where is your problem? No problem, Gerald. All suggestions are more than welcome to enrich the debate. But I presumably then have the right to comment on what I perceive as inherent weaknesses/ inconsistencies/ incoherences in such suggestions. Do you have a problem with that? I’ve no problem with describing your perception as long as it’s clear that it’s your perception. Just don’t try to fool people who may only occasionally read the comment section. In cases your perception differs hugely from the “official” or “established” interpretations first check, whether there may be a flaw in your own reasoning. There is no warranty that the “official” version is always correct, but this doesn’t justify claiming “electric universe” ideas as to be correct. There may be thousands of approaches to resolve potential issues. Some issues may simply stay unresolved or controverse. Usually the scientists are looking for anomalies and discoveries themselves, and publish it as soon as possible. Nevertheless it’s possible to find something interesting that isn’t published yet. Hit the wrong “Reply” hyperlink. See end of thread …. … more seriously, the most straightforward approach is probably perspective. When looking almost along the direction of the jets (flying through the jets! ), perspective suggests higher curvature than from an orthogonal view. The curvature is then easily explained by the rotation of the comet and/or by some additional interaction with solar wind. 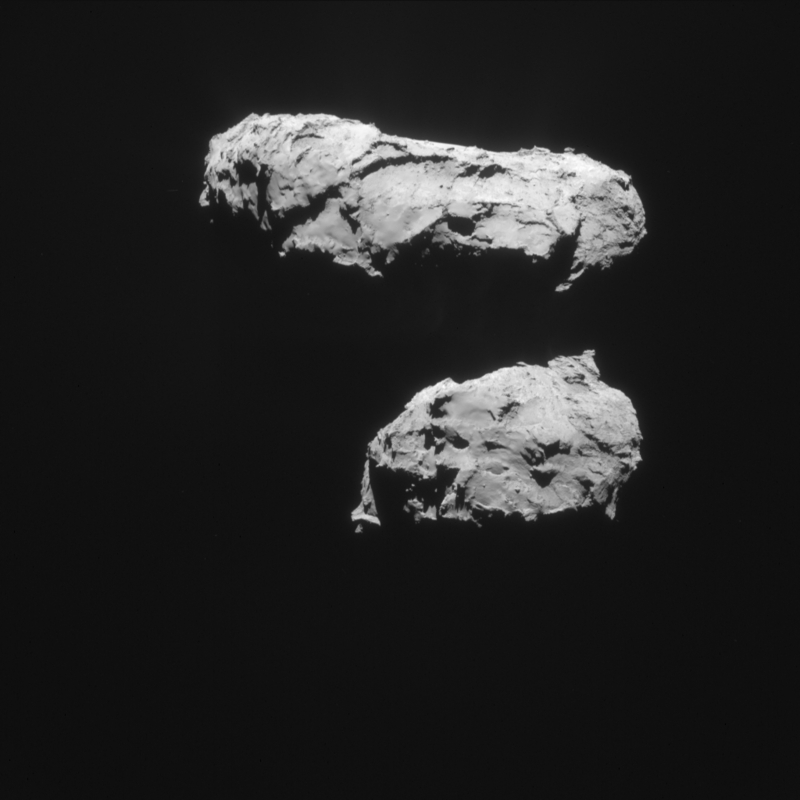 The good news in this approch: Rosetta may have collected samples from one of the jets! … add some possible radiation pressure. Essentially, for slow dust, rotation and perpective are sufficient to explain the curved looking jet. So it doesn’t show exactly the surface gravity, but the gravitational potential modified by centrifugal force. Hi Claudia an H. NAVCAM Team. Betting again for magnetic axis somewhere at upper left quarter. Surface material proving to be quite refractory. Striking line on top of left margin. Great the ‘tactile’ feeling, and ‘quadrature’ [or ‘rhombous-ity’] of this head crater, at this particular shot. Speculating impact crater’s geometries could be partially driven by former layering configurations. Could ‘Great Walls’ be related to this kind of impactings? Any info about plasma and magnetic field measurements? This image, with its jets bending through 90° just after leaving the cliff face bordering Hapi Valley on the head-lobe side now helps us to interpret other puzzling images in a new light. Coming back to the picture above, it is thus clear that here too, those multiple powerful jets shooting out of the darkness from the head-lobe side of Hapi Valley are all bending at right angles so as to avoid Hathor, on the other side of the canyon. I take this to be indisputable prima facie evidence confirming that 67P, like all comet nuclei (it’s their defining property), is a negatively charged body: in the case of 67P, we fortunately have this Hapi Valley canyon separating the two lobes to conclusively prove it: both of the opposing cliff-faces are negatively charged, therefore the jets are following the electric field lines generated in the immediate environment of two negatively charged bodies. (See the link http://www.physicsclassroom.com/class/estatics/Lesson-4/Electric-Field-Lines which Harvey kindly pointed out to me a couple of days back on a parallel thread). And looking forward, we have the exciting prospect that there will logically be even more such images of sharply bending jets from the canyon walls in the coming weeks and months, as activity steadily increases. Rosetta will continue to teach us what the true nature of comets is by visible evidence of its electrical behaviour (as it already has done by its extraordinarily “unexpected” appearance and by the clear anomalies in the temperature data), all totally inexplicable by the standard theory but completely consistent with the EU model. Which I pointed you to and you completely misunderstood. It applies TO CONDUCTING BODIES in the example in wiki. NO such boundary conditions apply to an insulator. 67P’s behaviour shows that it IS a conducting body. That’s the whole point! Interesting. How could CONSERT radiowaves penetrate parts of the surface, if it’s conductive? Exactly; not to mention that we’ve been told its solid rock since forever. But consistency never was this ‘theory’s’ strong point. And if it *is* conducting, the valley would clearly be a low field region, as already pointed out. I suppose we can all agree that it’s neither a true conductor nor a true insulator, like the Earth. It’s enough of a conductor, in any case, to have been opaque to the CONSERT radio waves which bounced back and forth between Rosetta and Philae over the *longer trajectories* through the core (as Harvey pointed out during the debate on the homogeneously void-free interior…). And it’s enough of a conductor to have built up a large net negative charge during its time spent before and after aphelion, which is now discharging as it now obliquely approaches the Sun. I have posted calculations on this before. It is numerically ridiculous to assert that this a a body which has charged & is now discharging. A calculation of it capacitance, charge & voltage, first year physics, give numerically ludicrous results, given in other posts, never refuted. A material does not have to be a conductor to be lossy to radio waves. There are plenty of other mechanisms, both dielectric & magnetic. High CONSERT attenuation (actually, in absolute terms, very low; its a long path) proves nothing about conductivity. It doesnt even have to be a conductor to build up a charge! And you simply *assert* that it has accumulated such a charge, without experimental evidence or mechanism. If these (charged) jets are supposedly being deflected by the electric field between the lobes, along with interacting with each other, then where is the associated bremsstrahlung radiation? Since bremsstrahlung radiation has a continuous spectrum there are a variety of instruments on Rosetta that would be able to detect it’s existence including the imaging system. Sjastro, whilst there are many, many reasons the ‘discharge’ stuff is wrong, this argument doesn’t work. For the velocities and radii involved here, Bremsstrahlung would not be significant. We are only talking hundreds of m/s and radii of tens or more metres. I must admit I’ve not actually done the sum, but I don’t think that will give noticeable Bremsstahlung. Which is NOT to be interpreted as support for EU theories, just that this particular ‘absence’ does not negate them. Many other things do. This needs to be looked at in the contest of the “discharge stuff” as you have phrased it. Unfortunately Thomas leaves a lot of unanswered questions forcing one to join up the dots in order to make some sense of his claims. Since Thomas states the material moves under the influence of an electric field, one might as well treat the material as a plasma. This is consistent with the EU view that it’s all about plasma physics, a subject that astrophysicists apparently know nothing about. If this material is a plasma there is no reason to impose non relativistic limits on particle velocity, particularly if the comet’s “electric field” causes the formation of double layers in the plasma. Hence there is no reason to rule out Bremsstrahlung radiation. I would agree that for relativistic particles it would be an issue. To be fair on the EU community, they have never suggested relativistic enegries; but then they never suggest any numbers for anything at all, so cannot be ‘attacked’ numerically. So for relativistic, agreed, an issue; NOTHING in this post supports the EU position! Its just that this aspect probably would not falsify it for lower energies; *MANY* other things do. That’s exactly what you have been waiting for all the time. It’s a North Polar shot, Gerald. a while ago, I believe, “dead straight” was indisputable proof – now sharply bent is the same? You apparently haven’t been following the reasoning. 67P being an electrically charged object, the trajectory of the dust jets is determined by the electric field lines surrounding the comet nucleus. If you look at Harvey’s link (http://www.physicsclassroom.com/class/estatics/Lesson-4/Electric-Field-Lines), you will understand that depending on the relative polarity of the objects in their vicinity (in this precise case, the negative polarity of the two opposing canyon walls), the field lines, thus the jets, can be either “dead-straight” or “bent”. The jets from the FLOOR of Hapi Valley are logically dead straight. The jets emanating from the canyon WALLS bend at 90°, and then continue dead straight. (Look at the image again). Do you have an alternative explanation using simple thermo-kinetic mechanisms such as “wind”? Yes, dust jets driven by sublimating ice due to heating from solar illumination in a three-dimensional settings of a close to electrically neutral rotating comet. Your electric comet violates the laws of electrostatics. Since an electric field is a vector field with a unique magnitude and direction, electric field lines can never intersect. This is explicitly mentioned in the link you referred to. Yet even using your own method of pareidolia science fails as the jets are not moving on electric field lines as they overlap. This is plainly obvious as your “90 degree” jet intersects a vertical jet running along the left hand side of the comet. What a lovely word, Pareidolia, I’d not come across it before! Whilst not an ‘explanation’ of EU, it certainly is an excellent description of chunks of it. You are of course absolutely correct regarding field lines, which cannot cross. Charged particles don’t follow field lines anyway; the local field gives them local force, and you integrate up to get the path. “…the jets are not moving on electric field lines as they overlap. It’s not “plainly obvious” at all. Nothing in this 2D image allows you to assert that any of these jets are “intersecting” or interacting in any other way, for that matter. To demonstrate the exact opposite, I’ve posted a comment below pointing out my observation of much smaller jets from Hathor which are ALSO bending sharply, in *different* directions, to avoid the negative charge of the facing canyon wall. Even in a 2D image, this sort of observation is incontrovertible, just like the more obvious plumbers pipes on the other side of the canyon. The trouble with pareidolia science Thomas is you can be very selective in what you see and how you interpret it. Using your own standards I see a jet running vertically and TANGENT LIKE along the top lobe of the comet on the left. Very strange behaviour for electrostatic repulsion at work. Thomas: If you could find a a way we can use the charge on 67p for the Philae batteries, I am sure the ESA (not to mention all of us who love it so much) would be delighted. Charged objects do not, as you seem to imagine, ‘follow electric field lines.’ The interaction of the charge & the field gives you the local vector force. The trajectory is given by the integral of the accelerations caused by those forces. It does not have to follow field lines. I still suspect this may be an illumination etc artifact; gas jet interaction looks unlikely as the density is probably too low; electric field likes can’t cross over either. If it really were conducting & charged, field in the bottom of the valey would be roughly straight up *but low*; field from the ‘walls’ would intially go straight out towards the middle of the valley, & then bend outwards radially away from the valley bottom. (Not perfectly, because its not perfectly cylindrically symetric.) They certainly would not to any significant extend turn ‘sideways’ in the circumferential direction around the neck, as these seem to do. As ever, you see what you want to see & ignore real physics. Jacob: There is also that line shooting out of Ash leftwards. All of you basically waiting (in vain) in here for the whole of the standard model to crumble: why not head over to the LHC? I would not bet money on your luck there either, but in here disappointment it trickling in for you on a slow but regular basis, whether you care to recognize it or not. Sjastro, I cannot see your intersection of jets. merely 1 jet passes the other, assuming you mean the vertical jet and the jet with the 90 degree pipe bend. Gerald, I cannot understand your view on perspective, how ever I look at the plumbers pipe jet, I cannot understand what angle you are looking at the pipe jet to come to such a conclusion? Also If you do believe the pipe jet has been produced by sublimation of water ice due to illumination, how is it that the area the jet is coming from is in shadow, yet is very large and active? If its a sublimation causing a bent jet (assuming perspective is not the solution), then there is a huge amount of explaining to do as to how sublimation can produce this shape. If you are against the EU model that’s fine but you need a credible solution for the model you support, at the moment I would say that is going to be very difficult. The jets in that animation are rather straight. Actually they are little curved; think for this purpose of a rotary lawn sprinkler due to the rotation of the comet. Go to one end of the “plumbers pipe”, assume it’s curved to the left, keep the pipe, move your head a little to the right. Or look at the right side of a round table from the side just above the level of the table. You’ll see the curvature. Consider also, that it’s more than one jet. If it’s more than perspective, we may actually see some aerodynamic interaction. Gravity will play only a minor role at dust velocities of several meters per second. And there is some “self-heating effect” from the black body radiation of illuminated/”heated” parts of the comet. What I’ve not yet read in “official” papers is a possible heating by resublimation of gas from the other side of the neck. Solar wind will be shielded mostly by now. Thanks for explaining your perspective theory Graham, I had considered exactly as you described as a possible solution. I did not think it would work as an explanation though. We could do with another picture from the same area to test perspective, and get a clearer idea of the feature. If you ignore you’re perspective solution for a moment the plumbers internal bend radii looks less than twice the diameter. It would therefore take some doing to bend a near supersonic column of gas and dust in such a tight space, not only that, no dust appears to get lost from the jet in the maneuver and the shape of the column stays intact, this can be difficult (avoiding distortion) even when you bend a plumbers pipe. Its truly a spectacular feat. Checking the jets from different perspective is useful, for sure. This will narrow down the options. The gas is probably supersonic. The dust speed is under investigation. The numbers thus far for dust are at most 10 m/s. But I’d consider this as preliminary, since the gas density varies, and so may do its capability to drag dust. The dust velocity and acceleration is certainly a science objective, since the existing theoretical models contain several unknowns we’ve now the opportunity to determine. Potential interaction between the jets is another science objective to be refined with the Rosetta data. Dave, (and others), talking about the ways the jets from opposite sides of the canyon are carefully avoiding interaction, I have now identified smaller jets emanating from two different places of the Hathor cliff (opposite the source of the plumber’s pipes) which are also bending sharply, either to the left or to the right in the 2D plane. In 3D, we can assume they are also curving upwards, to avoid the negatively-charged canyon wall opposite. Are there still any takers for the “just the perspective” or “optical illusion” hypotheses? The contortions required to still maintain them are increasingly looking ever more tortuous even than these bending jets from the Hapi Valley canyon walls… This curious behaviour needs to be accounted for and I see no remotely plausible standard theory explanation for it. I don’t think it’s just Gerald who is against the “EU model”. Anybody who is scientifically literate, and possesses a degree is against it. For a number of reasons. Main one being that it doesn’t add up on any level. See Tom Bridgman’s blog. Numerous questions asked, none answered, It is nothing more than psuedo-science and god of the gaps nonsense. As usual. How about the previous posts showing the density of this object to be less than that of ice? How about all the H2O being emitted by this object? How about the nitrogen isotope analysis that shows that this object was formed somewhere very cold, in the outer solar system, not blasted off a planet by some electrical woo-woo? As for needing support for the current model, I suggest you wait for somebody with the qualifications and intelligence to interpret the data. Sun behind us, slightly up. Gyrating counter-clock wise. Rotation axis around the main jetting. Impacting wind sun speculatively from up-left. Suggesting jet directly streaming down bottom, sourced to the left body’s horizon [Non eclipse related]. Suggesting also slight turbulence between body and head’s atmospheres. There is a ‘phantom’ of a enveloping dust. Not directly related to sun jetting. ‘Atmospheric’ dust? Electrostatic dust? Glow? The contrast is not that much as to insist anymore on sensor issues. I agree with you, Thomas! You do have the right to comment on what you perceive as inherent problems … as do I! The “Electric Universe” is a pseudoscience! A false science! After nearly 60 hours of research and reading on EU/ES/EC/PC physics, I found nothing of substance. Mainstream science knows that electricity is an important force in the universe, but its effects can be masked. Here’s a simple thought experiment using real physics … take an isolated system containing two protons separated by a short distance, say 1 mm. Which holds more sway? The electric force of repulsion? Or the attractive force of gravity? The electric force, of course! Now add one electron to each proton. The electric force has been nullified (i.e., q = 0, F = 0). The effects of gravity have not! In this second case, does EU need to invoke a special form of physics to restore the electric force to dominance? If so, please enlighten! And while you’re at it, please provide the EU based charge and potential difference values for the Sun, Earth, 67P and Rosetta! Here’s a fun fact … the solar wind was first modeled by Eugene Parker in 1958, and experimentally verified in 1962. I’ll cut you some slack … together we’ll work on the experiments to verify EU, if EU will present a model that shows how charge and voltage vary with time for these four objects! Go! Now you’re doing science …. And on the issue of models, what is it about the “standard model” of comet genesis and evolution that upsets you? Is it the evidence that contradicts your world view? Is it possible that scientists over more than fifty years have been falsifying comet data? Is there evidence to support a claim of academic and/or scientific misconduct? Because we are on a Rosetta website, I would like us to stay on topic. No tangents! Comet science only! Now, as we both know, MIRO is specifically tuned to detect all isotopologues of water (Gulkis et al, 2006). At 3.6 AU, MIRO detected water being ejected from 67P at the rate of 10^25 molecules/s (Gulkis et al, 2015). Do you dispute this fact? At a distance of 1 AU, the solar wind has a velocity of ~400 km/s and a proton density of 1.1E07 p/m^3 (Schwenn, 2001 in the EAA). Given that proton density varies as 1/r^2, we find that at 3.6 AU, the proton density drops to 8.5E05 p/m^3. This equates to a proton flux density of 3.4E11 p/m^2s. With an OSIRIS space model volume of 21.4 km^3, we determine the surface area of an equivalent sphere (a standard simplifying assumption when doing “order of magnitude” calculations) to be 3.7E07 m^2. While I’ve never seen any EU data, I am certain that the EU community can predict the sputtering rate as a function of heliocentric distance. In the meantime, we will assume a perfect sputter, where one proton strips and immediately binds with an oxygen atom from the surface of the comet. Because the MIRO sub mm spectrometer employs EM radiation to detect water molecules, the second half of the sputtering process must also be instantaneous to ensure a water molecule has been fully assembled before it’s electromagnetic fingerprint is detected by the instrument. We will also assume (for the benefit of EU “science”) that the entire spherical surface is involved in the process (i.e., the ~400 km/s solar wind is able to impact the illuminated and non-illuminated surfaces of 67P at the same time). Using simple mathematics, we find an EU DEFICIT EXCEEDING SIX ORDERS OF MAGNITUDE. Thus, for sputtering to be a viable mechanism to produce the reported volume of water at 67P we would need ~1000000 times the proton density! In reality, of course, a perfect “sputter” is absurd. Perhaps dropping the efficiency to 1% might yield better results for EU? Now, what part of the EU model do I not understand? But wait, there’s more … the RPC-ICA indicates that protons are already being deflected AWAY from the comet’s nucleus, further reducing the sputter rate to zero. Things are not looking good for EU on this point. Regarding the oft discussed VIRTIS temperature maps … I see no anomaly! Tosi and the VIRTIS team have recently said as much (ref. 46th LPSC abstract). Do you really believe there is a conspiracy to withhold data that would corroborate the EU model? Maybe there are technical problems with the instrument suite? As you will note, the temperature range is only 40 Kelvin peaking at 220 K. At these temperatures, a handful of 67P will cause serious frost bite in short order. Here’s another fun fact (that no on ever seems to discuss) … Thomas et al (2015) employed a thermodynamic model using insolation data from 2014/08/06 and the OSIRIS shape model to show that ~10% of the thermal flux in the Hapi and Hathor regions could be due to self-heating by thermal re-radiation from the head and body. Thoughts? I wonder if 67P shares similar internal composition and structure? Thomas, if EU wants respect and credibility, you (or someone from the community) MUST address the comet science issues and questions scattered throughout this post. Sadly though, I expect you will make no effort to bring a viable EU model to the table. In this case, a viable model is one that is internally consistent and actually accounts for the preponderance of cometary data collected over the last several decades, and especially in the last ten months! Booth. Best of luck with the numerical arguments; we rehearsed *exactly* this a while back, but the EU community never, ever ‘does numbers’ & simply ignores inconvenient facts – such as a trivial calculation of capacitance, charge, voltage, dischare time etc. FYI I ran SRIM ion implantation codes for 5keV protons into silica (simply a convenient, vaguely appropriate target.) I posted links to the (free) codes for this a while back. As its Monte Carlo you need a reasonable PC or its very slow. I just re ran it; at just over 4000 input ions, *not one single target atom has sputtered*. Sputter yield for proton irradiation are very low because of the low proton mass. Now 5000 input, no sputter events. Ok, after running 54000 odd ions, the O sputter yield has stabilised at 1.78%. For some reason it hadn’t updated the yield earlier. This is 5keV at normal incidence. 10KeV normal ~1.2% only based on 1000 ions though. Oblique incidence increases it a bit; at 60 degrees, 5keV, O is around 3.5% and Si about half that based on 1000 ion, rough. Basically, low energy protons are very inefficuent sputterers of O & even worse at Si. Must be a Monday! Used the wrong “Reply” hyperlink, and then hit the submit button too soon! Thomas, I need to return to your first set of comments because I forgot to mention a couple things. Apologies for being so long winded! Two problems with this statement. 1) The preceding statement incorporates your words! Not mine! I say what I mean! I stated clearly that physics is universal (explanation to follow), and I stand by that. By editorializing, you are expressing your personal opinion! Not mine! In future, please, choose your words more carefully, or better still ask a pointed question. 2) I don’t see how 67P is severely constraining the laws of physics. To date there have been no reports of violations by the mainstream science community. The fact that Rosetta is escorting 67P on its journey is evidence that gravity still works (including the gravity assist maneuvers used to get the spacecraft to target). All the instrumentation, cameras, and communication equipment onboard Rosetta are based on fundamental physics … especially electricity and electromagnetic radiation. The data being returned from Rosetta compliments and enhances the statistical reliability of the results obtained by our remote sensing efforts and in situ measurements over the last several decades. How is this constraining? When there is no evidence to support a model, should it not be thrown out? The laws of physics are universal, just not cast in stone. And if they are not universal, how would we explore space and land craft on comets and other planets? How could we communicate through this forum? Does EU know the scope and scale at which the laws of physics breakdown and change? Some aspects of physics have been studied and experimentally verified over centuries. Gravity and electricity for example. Every undergrad in physics spends countless hours in the lab revisiting these universal laws so as to gain personal experience with their effects and implications. It is because physics is universal that we can go out and observe, measure, and communicate information about our world. Physics deals with matter, gravity, electricity, fluid mechanics, thermodynamics, optics, planets, comets, stars, galaxies …. 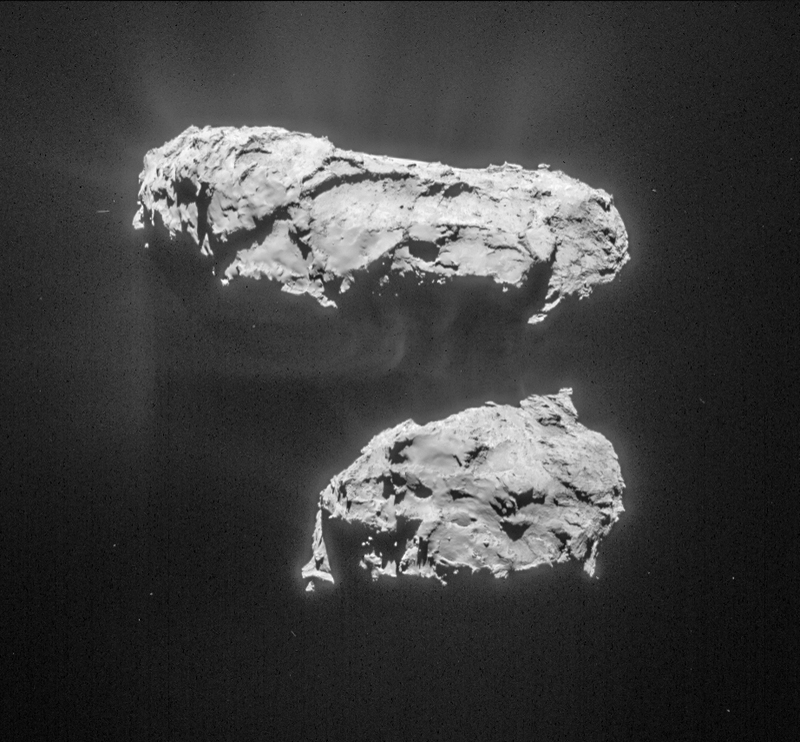 How does EU address the volume of water and dust being ejected by 67P? Answer please? It is worth noting that the standard model is an evolving “thing” – and standard in the sense that it is something we can compare our data to. When discrepancies are found, the model is modified to include the new data. On occasion, several aspects of a model may need to be modified. If a model is stout, it will maintain its predictive capabilities. Sometimes a model can no longer operate with the data being collected. When this happens, it gets discarded. Case in point, we continue to research Big Bang cosmology because the Steady-State model could no longer be modified to include the empirical data that was being collected. To avoid unnecessary complications, comet physics does not need to reference quantum mechanics or physics operating at galactic scales. When talking about 67P, we only need concern ourselves with the applicable physics. If you disagree, I would like to know how neutrino flavours and galaxy rotation curves effect 67P’s structure, composition, and gas sublimation rates. You write, “What happens when smoke leaves a chimney and is caught by the wind?” How do you find this particular “Earth analog” helpful? Which particular “universal” law of physics are you invoking? Atmospheric physics, compressible fluid flow and thermodynamics! Chimney heights were variable. Gas discharge rates and chemical compositions were variable. Atmospheric boundary conditions were variable. The model was designed to track the dispersal patterns of industrial combustion waste. The addition of topography and realtime tracking was to be the next step. It was all about corporate liability! So, what really does happen when two sublimating flows interact across a valley? I don’t know yet. Harvey called me out on it, and I’m going back through my old notes and texts to see if I can make sense of a non-terrestrial activity using … an Earth analog. 😎 Boundary conditions are subject to change! And thanks for the questions! In the case of 67P, Earth analogs can only be used to draw comparisons, not state fact. If it looks like a terrestrial smoke plume, maybe I can use fluid mechanics and thermodynamics to model it. If it looks like a rock, maybe I can sample it to verify my observation. We must be careful when making statements about what we see. I’ve seen glacial terrain that bears a striking resemblance to features on 67P. Does that make 67P a glacier? No! Caution. The “Atmospheric physics, compressible fluid flow……………etc ” we are all used to is *viscous flow*. We dont have a pressure profile round 67P, but not far from the comet mean free paths will become of the order of or bigger than the scale size of the phenomena concerned. You then enter the ‘molecular flow’ regime. In molecular flow things are very, very different & our ‘intuition’, ‘everyday experience’ tend to get it badly wrong. Its especially tricky here because we have a huge pressure gradient & differing scales. That ‘contour’ will move out further as sublimation increases. Perhaps an example would help. Consider, starting from the left, a pump connected to a volume V1 which has a helium supply connected to it via a restriction. The volume is connected via lets say a metre of 25mm pipe to a second volume V2 which has an argon supply connected to it. The pumping speed & argon supply are set so that the pressure in V2 is say ten times than in V1. Obviously there is a howling gale of argon belting down that 25mm pipe to maintain that factor of ten pressure difference. Intuition tells you that that will prevent any helium flowing ‘backwards’ from V1 into V2, left to right, & intuiton is right *in the viscous flow regime* we are all used to. But drop the pressure to say 10^-6 Pa in V2, 10^-7Pa in V1. The mean free path is now much greater than 25mm. Molecular flow. He atoms will happily diffuse to the right towards V2 & will ‘not be aware of’ Ar atoms moving to the left, because they almost never collide with them. In equilibrium, the He pressures in V1 & V2 will be almost equal! Anyone who works with vacuum systems gets used to the oddities of the molecular regime; but behaviour there is quite unlike the viscous regime & can seem very counter-intuitive. You may like to go to Miles Mathis web site, here you will a Grand unified theory that is worth a look, he has gone back to basic principles, showing how Newton & Einstein ignored the fact that G was a composite of forces and much more. There are a host of other papers with it and some may even shed light on the Comet we are all watching.